There were the toys of infancy: the Rock-A-Stack and the Shape-O Toy Ball and the telephone and the corn popper. There were the toys of pre-teenhood: G.I. Joe and Masters of the Universe and dozens of other action figures. And then there were the toys that fall somewhere inbetween, the toys that filled the playtimes of my toddler years. 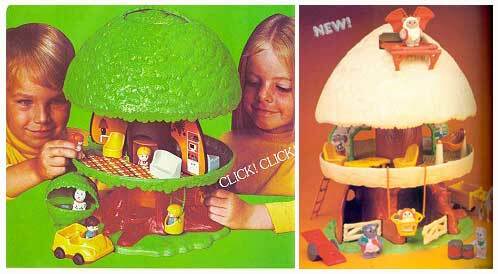 One of the most memorable of these was Kenner’s Tree Tots Tree House. The Tree Tots Tree House came out in 1975 (at which time I would have been one year old). A first glance it was just a tree, just a hard plastic green and brown tree. But a push of the square button under the thin handle at the tree top caused the boughs to bounce up and reveal a very 70s-ish little home complete with a kitchen, living room, and bed room. In this home lived Treemont, Willow, Honey, and Chip Treetot, along with their dog Barky and cat Chesnut. A staircase could extend from the floor of the Treetots home to the ground below and an elevator ran up the tree trunk. There was also a tree swing beneath the home and Barky’s house (inside a bush, of course) on the floor. And as I said, this toy was very memorable, but not for good reasons. I was afraid of this toy. I’m not exactly sure why today. Part of it had to do with the fact that it was very difficult for me to push the button at the top with my chubby little fingers, and when I finally did get it, the tree top popped up so fast that it scared me. Another part of it came from the fact that when the tree top was pushed down over the Treetots, it appeared as if the tree was eating them (the kite-eating tree from Peanuts probably contributed to this notion)! And I think we can all agree that Barky’s house is fairly reminiscent of Audrey II from Little Shop Of Horrors. That’s just too creepy for a kids toy. But despite that creepiness (or perhaps because of it), the Tree Tots Tree House made a sizeable impression on me, sizeable enough that I still remember it today. In fact, there are times when I wish I could get my hands on the tree house again and push that square button one more time. Umm, well, maybe not actually push it. That’s too frightening But I would like to at least see it again. I did not have the Tree House, but I did have that Dog for some reason in my toy collection. I loved that dog. I know I had a friend that had one of those, but my strongest memory of that toy is that it appeared in an episode of “Are You Being Served?”. I believe the title of the episode is “A Change is as Good as a Rest”. Great post as always, Doug! I recall them using this tree house again…for the Winnie the Pooh playset. I might be wrong about that though. I too had this. It was awesome! @VicSage – I am pretty sure they reused it for some animated Ewoks toys at one point. Awesome toy. My sister had it, and although I enjoyed masculine action figures too, this little beauty had a soft spot in my heart. Loved the expandable tree roof and the cool elevator. Who doesn’t want an elevator in their house? I too recall it being recycled into some other toy line too. Not sure which. Maybe Weebles? I don’t know if they made a Weebles version of it, but I know that I put my Weebles in it. Anything that was vaguely weeble appropriate become a home for my weebles. I have this toy. My grandmother saved every toy of mine…. Next post Jim Henson’s…Wizard of Id?